Britney's Steppin' Out Dance Studio offers a variety of classes for students of all ages and abilities. All classes are 1 per week unless specified. For assistance with class placement for your child, please contact the studio. Contemporary dance is a style of expressive dance that combines elements of several dance genres including modern, Jazz, lyrical and classic ballet. Comtemporary dancers strive to connect the mind and the body through fluid dance movements. Students will wear a designated Capezio Leo or solid color tank top, jazz pants or capris, black split-soled jazz shoes. Hair must be up and out of face. 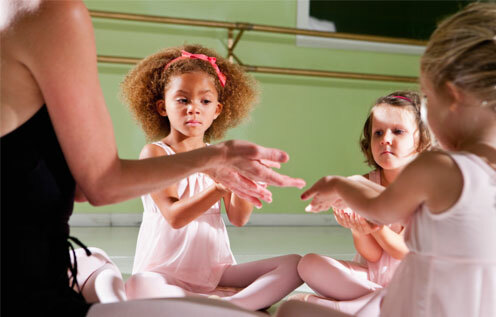 Lil Ballerinas Combo class introduces young children to music and performing arts. The program helps students develop listening and motor skills, body awareness, endurance, concentration, group cooperation and individual expression, coordination, and balance. Introduces dancers to ballet, tap and Jazz. Class is held twice a week. Students perform two dances in the recital. 45 minute class offered 2 days a week. Students should wear a solid colored leotard, pink or black tights, pink or black ballet shoes, black tap shoes. A dance skirt is optional. No tutus or old recital costumes should be worn to class. Hair must be up, pulled back and out of the eyes. Ballet is the foundation of all dance forms. It is a classical dance form characterized by grace and precision of movement. Dance instruction includes proper technique and terminology. 1 1/2 hour class, 1 class per week. Students should wear a solid color leotard, pink tights, ballet skirt (optional), and pink split-soled ballet shoes. Hair must be worn in a bun. Leg warmers are optional. Tap dance consists of rhythmical sounds that are emphasized by the taps on the dancer’s shoes. Dance instruction includes combinations of simple and complex rhythms, technique and terminology. 1 hour class, 1 class per week. Students should wear a solid color leotard, or solid color tank top, jazz pants or capris, and black tap shoes. Hair must be up and out of face. Jazz dance stresses body isolations, coordination, rhythm and syncopation, and the development of strength and flexibility. Class includes lyrical jazz, hip hop, funk, and performance techniques. 1 hour class, 1 class per week. Students should wear a solid color leotard, or solid color tank top, jazz pants or capris, black split-soled jazz shoes. Hair must be up and out of face. Lyrical dance is the fusion of ballet and jazz technique. Expression from the inner emotion is a primary factor in choreographing and interpreting this art form. Lyrical dance interprets music or words, showing the audience the emotion of the particular piece. A strong emphasis on stage presence is encouraged.1 hour class, 1 class per week. Students should wear a solid color leotard, or solid color tank top, jazz pants or capris, with bare feet or foot undies. Hair must be up and out of face. Hip Hop dance is structured street dance primarily performed to hip hop music. Students can wear any T shirt, black dance pants or capris, clean sneakers or black jazz shoes. No jeans or shorts are allowed. Hair must be up and out of the face. 1 hour class, 1 class per week. This class teaches the fundamental techniques of singing, acting and dancing in musical theater and is offered to all ages/levels.1 hour class, 1 class per week. Our Technique and Stretching class is highly recommended for all dancers in intermediate and advanced classes to improve their overall technique and endurance. 1 hour class, 1 class per week. Students should wear a solid color leotard, black jazz pants, black jazz shoes. Hair must be up and out of the face. This is NOT a gymnastics class. Student will learn tricks and acrobatics for dance routines such as aerials, front and back walkovers and chin stands. 1 hour class, 1 class per week. Students should wear a solid color leotard, or solid color tank top, jazz pants or capris, black split-soled jazz shoes or sneakers. Hair must be up and out of face. Prepares students who are planning to try out for drill/dance teams in high school. Emphasis is placed on flexibility, technique, strength and performance abilities. Students will learn kick line techniques, as well as leaps, turns and dance steps commonly required for tryouts. Special emphasis on stage presence and showmanship. Offered in spring session only beginning in January. Tuition $55 per month. Instruction includes coaching for stage presentation for all areas of competition (talent, evening gown, swimsuit) and on stage question. Also includes instruction on contestant paperwork, platform development, onstage presence, walking, posing, turning, microphone use, make-up application and wardrobe consultation. All ages. Dance choreography/talent presentation development is also available at an additional cost. Private classes only. $50 per hour. 1 hour minimum. Includes personalized interview preparation, take-home workbook with practice questions and mock interviews. After pageant class available to review and critique pageant performance to target areas of improvement. Private classes only. $100 per hour first class then $75 per hour. 1 hour minimum.